The elements that moved me to write Post Pardon–yes, there are fairies involved! Originally written for a graduate class, The Irish Female Imagination, taught by Margaret O’Brien at UMass, Amherst, in 2004. Post Pardon is a series of poems loosely based on the death of prize-winning poet Reetika Vazirani, who killed both herself and son in a murder-suicide. Her two year old son’s name was Jehan Komunyakaa, bearing the same last name of his father, the Pultizer Prize winning poet Yusef Komunyakaa. Reetika and Jehan were found dead July 18, 2003 in the home she was housesitting, on the dining room floor, parallel to each other, with cuts to the left wrist, and a kitchen knife at Reetika’s side. What sparked my initial interests in this story is that three weeks prior to their death, Reetika, Jehan, Yusef and myself were at the Andy Warhol Museum, in Pittsburgh. Yusef gave a reading, and they came to support him. During that same week, Yusef instructed a workshop I attended. In it, he told us to: “work with the content; to not constantly cut it all out, but save as much of it as possible.” Now, those words are quite chilling. The purpose of Post Pardon is to restore the cut content. People who knew Reetika and Jehan, who met Yusef, all wondered, how could something like this happen? People who never met any of them, but read their work, wondered what would drive a person to do that? Everyone that knew this story wondered: why? Post Pardon is an investigation of that why; it is an effort to occupy the mindset of a person who would commit an act of murder-suicide, in such a way where reason is not given, judgment is not passed, or excuses are formulated. The series of poems is a chorus of voices speaking from the interiority of a woman who contemplates life: the taking of her own and that of her only child. In trying to inhabit the emotional and mental space of someone who commits an act of murder and suicide, I had to find a way to articulate it without saying death, killing, murder, suicide, etc. The language best suited to speak this was limited and bogged down with blame, shame, and insensitivity. Furthermore, such words are abstractions. When read or heard they evoke the clichéd, commonly played upon images, and stereotypes. I needed fresh words, unrealized images, to offer a tale unheard. I didn’t want the poems to be an act of shaming Reetika or any other person who has killed themselves or their children, because I believe it is the feeling of alienation that is the source of such problems. Secondly, I had to divorce myself from the details of this particular incident. Staying so closely connected to one story impeded my ability to recognize that what Reetika did was not unique. Once setting myself free of the confines of her story, the possibilities of creating a female persona became limitless. Which gives a room a kind of fly-heartedness. In cuffless trouser we add to ourselves by looking. In McGuckian’s work, you are compelled to hunt for the images that will fit into your eyes. Her language is visceral, even though it may elude meaning, she permits you to respond to the mood of her interconnected images. In these lines : “Only that tiny slice of the house absorbed/ my perfume—like a kiss sliding off into/ a three sided mirror….” I react through and with something unbeknownst to me; it is definitely not language as we know it. It is an articulation through the skin, of the feeling that happens in the heart and belly. It is true that McGuckian’s poetry is abstract; I believe the reason for that is we still remain unclear about what happens to us on a bodily level. This may be the flaws of having our systems of meaning based on a patriarchal point of view; it has worked to exclude how Others make sense of their world. The refreshing aspect of McGuckian is that her language is rooted in the pores, in a metaphor system that starts from the inside out, “offer[ing] alternative social visions that do not conform to existing modes” (Brazeau 128). In Post Pardon, I use this strategy of reinvesting language with new meaning, letting it spring from a female’s subjectivity, from the way she moves in the world, insofar as to allow her to be heard without the damning consequences of a language that will condemn her. In tackling how to write my poems about Reetika, I kept that statement in mind, treating my subject matter as McGuckian does meaning: slippery and with no structure for hold. Furthermore, the persona that is modeled after Reetika enters madness; she is not unified or stable. This is when my focus began to shift. The self I was interesting in exploring for Post Pardon did not occupy the public arena, where one can easily mask wellness by saying the right things or having acceptable behavior; I was interested in the point of view from an extreme state of mind. that’s the last I’d have seen of him. ‘Little laddie to me, to you little laddie. Ni Dhomhnaill brings the fairy world into the imagination of the speaker. By doing so, she does not need to explain that this woman is in an alternate state of consciousness, because such complex ideas are embedded into that otherworld. The speaker’s murderous urges are transposed on the three wet-nurses; they serve as the other self who is capable of committing a harmful act against her child. Irish mythology offers Ni Dhomhnaill a whole other landscape, as well of her use of Gaelic. In such spaces, she has the words to speak about madness; she has the ability to speak about dissociation as if it is an act of breathing. So despite the subject of the poem being off kilter, she can use the fairy world as a mirror to reflect her deeply personal struggle. and caught him by his left arm. I’d been carrying in my pocket. or I’d run him through. I cut it with my trusty black-handled knife. and laid them on the cradle. I’d have to bury it out in the field. What is so appealing about this poem is that the speaker has gone someplace that is perilous to herself and child, yet she still has the ability to speak it. Furthermore, I am drawn to hearing what the speaker has to say because the language and the rendering of the subject is not clichéd. As a result, my emotional response to the poem is not attached to a societal expectation of how I should react to a woman battering her son. Ni Dhomhnaill’s use of Irish mythology is a way of recovering the female body; it is an act of extending her language to incorporate more than one way of expression. To apply this idea to Post Pardon, I utilized a system of images and stories based in Caribbean folklore. When trying to decide what I could use to create a system of metaphors, I selected what was readily available to me. Caribbean culture, mainly Guyanese, has presented explanations for the events and occurrences that elude logic and rationale. Rooted in an ethos that allows for the living to talk to the dead, travel through water from one country to the next, and the killing her son, the female persona of Post Pardon can enter these realms while maintaining the plausibility of the voice. Caribbean folklore allowed me to imagine different possibilities for my subject’s state of mind. For instance, it is believe in Haitian culture that when a person dies, their spirit goes to live in a place described as being below water. The female persona of Post Pardon is visited by her father, who too committed suicide, and his arrival is marked by water imagery. His visitation, situates her in a position of vulnerability and longing for the company of her father who was absent throughout her life. Being able to create various possibilities of how she lived and felt in the world humanizes this tragic event, thereby restoring an empathetic relationship between her and the reader. This moment becomes personified and the poem becomes peopled. There is a feeling of a voice amplified, objects enter communication with the speaker, and the ‘I’ engages the environment as if it is a third person. Ni Dhomhnaill’s female persona is direct, by not letting life-mysteries reside in the complexity of language. McGuckian indirectly speaks about an event, a moment, an experience in such a way that her female subject and the environment co-exist without distinction. Essentially, McGuckian elevates language as subject of the poem; therefore all can interact and be imagined. 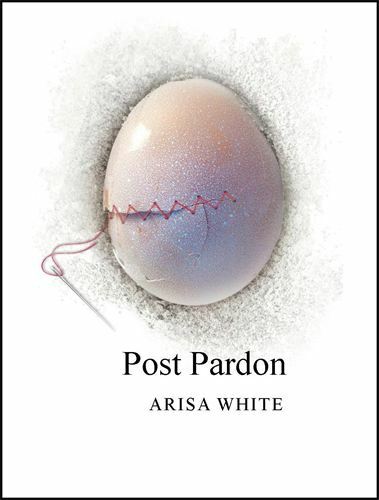 In writing Post Pardon, there are four distinct voices that make up the series. Some of the voices use language as a subject, some incorporate the frankness of Ni Dhomhnaill’s female personas, and they all are interested in telling a story that can make simple and clear this particular life mystery. Let me introduce you to the voices of Post Pardon: One is that of the female persona, telling the incident in a straightforward, linear fashion. The other is an extension of the female persona, but this voice is spending time at the edge; it perceives the world by first translating it through the body. The third voice is distant, hallucinatory; it beckons the female voice to the unspeakable. The fourth is that of an outside female that is connected to this narrative by way of the spirit world, she is followed by a ghost of a young boy no more than five. As a way to differentiate each voice, they are assigned particular placement on the page. When the poem has moved to a different position, the voice has changed. I wanted to create in the series a feeling of an echo, a splintering of the self into many, to illustrate that in the head is housed a chorus.